I know it seems that all has been quiet on the blogging front the last few weeks, but I can assure you that real life behind the scenes has been anything but! This past weekend was especially busy; Lucas and I got engaged on Saturday and then we hosted Thanksgiving on Sunday for a few friends. It was a whirlwind of excitement! 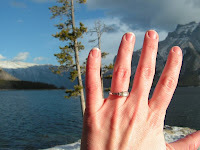 We went out into the Canadian Rockies to check out Lake Minnewanka in Banff National Park, and Lucas got down on one knee and pulled a ring out of his pocket there along the shore of the lake and proposed. It was perfect and completely unforgettable. You can read all of the details and see photos on our personal blog: lookatusgo! Since I signed up on November 18, I've been patiently awaiting my beta invite to Ravelry. I can't even begin to describe how excited I am about digging into it. From what I've read by those already in the beta along with the virtual tour I took and some reviews I read on various sites, I anticipate a new obsession. If you haven't already checked out Ravelry, I highly recommend it! Right now there are 4905 people ahead of me and 4113 people behind me in line, all eagerly awaiting their invite. Alright so there are 25 days until Lucas and I head to Indiana to spend Christmas with my family, and so that means 25 days to get all of my Christmas gift projects done. I'm not sure if that's enough time, but I'm sure going to try! 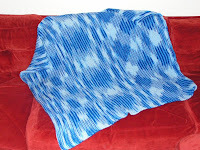 Expect a flurry of activity now that the big blanket project is finished as I work hard to complete a lot of my smaller projects between now and then!